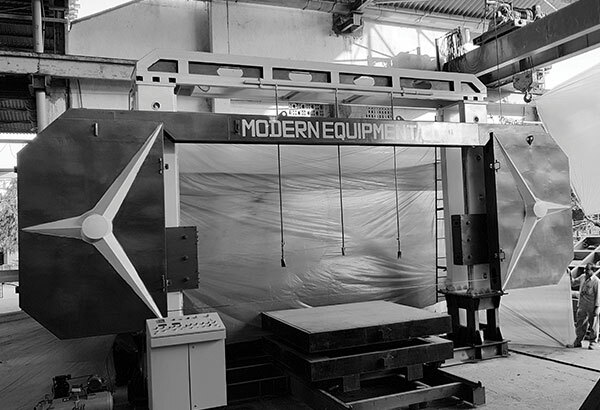 Machine Structure is made with Heat Treated MIG welded steel, ensuring the required stiffness for avoiding vibration at the time of cutting the stone. 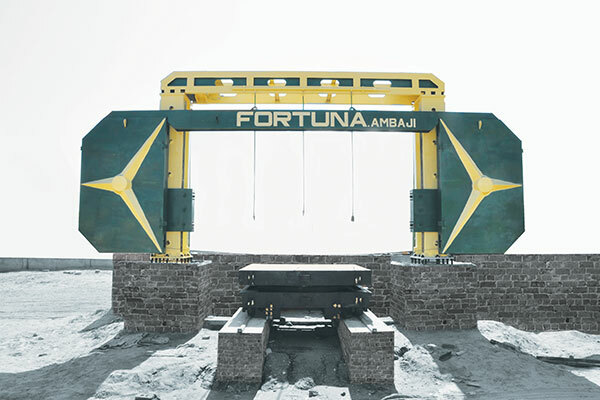 It has two vertical columns and are connected to steel fabricated Beam. Two opposite carts containing the components for the Wire Motion slide vertically along the Machined columns by means of Lead Screw mechanism. Thus moving the wire up and down. The wire is rotated by a Driving Fly Wheel with a Diameter of 1200 mm with A/C Drive controlled asynchronous motor that optimizes the wire linear speed according to the Hardness of the Stone. A driven pulley with the same diameter in constantly kept under tension by a pneumatic cylinder thus giving the wire the ideal tension. The mechanism is completed by two independent driven pulleys with a diameter of 800 mm installed next to the point where the wire gets in and comes out. Manually operated lubrication system provides lubricant to critical point. In order to ensure a high corrosion strength, both the structure and the components are painting with water proof ISI make paint. All pulleys are coated with special, interchangeable, wear resistant elastomer profiles. Limit switch connected to the stretching cylinder, detects any possible breakage of the wire and stops the machine instantly and also provided wire protection cover for prevent accident when wire Breakage. When cutting the wire lowering speed is automatically managed by A/C drive control system. And also controlled up and lowering limits by means of limit switches.